(NORFOLK, VA) – Lake Taylor Transitional Care Hospital has named Diane Schloegel, R.N., vice president of patient services. In her new position, Schloegel will be responsible for directing nursing and administrative patient care areas, as well as implementing standards of nursing practice that support and ensure quality patient care at Lake Taylor. Schloegel started her career in acute care settings after serving in the United States Navy. She brings an excellent mix of skills in nursing and patient care advocacy, including six years as a licensed nursing home administrator, and four years as a regional nursing consultant. 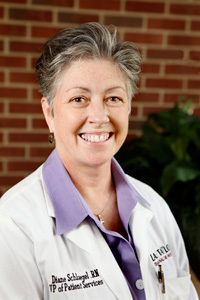 A resident of Virginia Beach, Schloegel earned her degree in nursing from Northern Virginia Community College.